1. Combine the curd, coconut powder, ginger and salt in a bowl. 3. Remove the crusts from the slices and cut into rounds. 4. Spread the curd mixture on 2 slices and cover with the other slices. 6. Add the mustard and curry leaves. 7. Place the sandwiches and fry till crisp on both sides. 8. Remove and serve hot with ketchup. 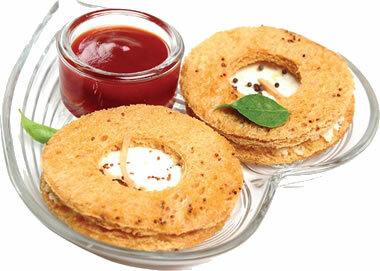 Feel free to comment or share your thoughts on this Coconut Sandwich Recipe from Awesome Cuisine.